At 2 pm on Friday, July 23 the who’s who of Nepal’s banking sector gathered at the Radisson in Kathmandu to listen to the Nepal Rastra Bank governor. Governor Dr Chiranjibi Nepal, who started his five-year tenure four months ago, was going to deliver his maiden monetary policy speech. The bankers were expecting that Governor Dr Nepal would announce a policy that would help the post-earthquake reconstruction efforts, and improve the capital adequacy of banks in view of Basel III. Some were expecting that the minimum paid-up capital requirement may be increased to as much as Rs 5 billion. “Going by the central bank’s track record, we were thinking that even if the central bank decided to raise the minimum paid-up capital, it would give the banks ample time to do so,” said Development Bankers’ Association President and Kailash Development Bank CEO, Krishna Raj Lamichhane. Governor Nepal did present a monetary policy that focused on reconstruction. But along with that he announced a four-fold hike in the minimum paid-up capital requirement for commercial banks and up to a 24-fold increment for development banks. The deadline he set was two years. “Increasing paid-up capital means to increase the capacity of the BFIs which is very much important for the sound financial health of the banking system,” said the governor in his speech. According to the new policy, commercial banks need to increase their capital to Rs 8 billion, and national-level development banks to Rs 2.5 billion. Similarly, development banks that cover 4-10 districts need to increase their capital to RS 1.2 billion, and financial institutions that cover 1-3 districts need to have at least Rs 400 million. Just a few days after the announcement, the central bank issued a notification to all BFIs to present their plans to comply with the new policy within the second week of September. “The capital plan must be submitted to NRB by September 17. It must include a timetable and clearly mention how BFIs intend to raise the paid-up capital (to meet the new regulatory level) by the deadline,” said the notification. Following the liberalisation of the banking sector in the late 80s, there was considerable growth in the number of BFIs in the country. In an effort to limit this growth, the central bank had come up with a new licensing policy for BFIs in 2007, under which commercial banks were required to have a minimum paid-up capital of Rs 2 billion. This meant that new banks would be issued licenses only if they met this requirement, and existing banks were given six years to comply with the new policy. But the central bank could not enforce this provision and extended the deadline. In its 2014 Financial Stability report, the central bank acknowledged that consolidation was important to improve financial stability, the BFIs’ intermediation function and access to finance. “Consolidation is essential for building sufficient resilience in the BFIs. Financial Consolidation can be in the form of mergers and acquisitions. Increasing capital and asset bases through consolidation would enable BFIs to mobilize lower costs, long-term funds and build greater resilience to shocks,” the report had said. According to the bank, as of mid-July 2014, nine commercial banks, 25 development banks and 27 finance companies were merged to become five commercial banks, 16 development banks and 25 finance companies. In the meantime, work was also going on on the central bank’s five-year financial sector strategy (2015-2020). The taskforce working on the strategy was thinking of the possibility of implementing a universal banking system. They system, when implemented, would enable the central bank to achieve financial consolidation and accelerate mergers and acquisitions. But the banking sector believed that all this was to happen in the distant future. As the governor finished his monetary policy speech, the share market, where BFIs make up the largest sub-group, responded to the hike in minimum paid-up capital. With just a few minutes remaining in the trading day, Nepse closed at 1003.38 (40.11 points up) compared to the previous day when it had increased by just 2.04 points. The rally continued after two days when the stock market reopened, and registered an even bigger rise of 48.2 points. With minor aberrations, the trend continued and Nepse reached a new high of 1191.92 on August 19. Shares of BFIs were in high demand in the market as three major possibilities emerged for the banks to comply with the new capital requirement: merger and acquisition, injection of fresh capital, issuing right shares and further public offering (FPO). NRB officials say that the new policy’s main objective is to make BFIs resilient to small shocks, and to enable banks to finance big projects without having to seek co-financers. The policy, although it facilitates mergers, was not introduced for that sole reason, they say. But Kaphle does not deny that NRB wants to slash the number of BFIs in the country. He says the policy has a direct message for BFIs who cannot raise their capital: “Get acquired by big banks.” The message seems to be directed at small development banks that are operating in a few districts only. According to the new policy, BFIs operating in 1-3 districts need to have a capital of Rs 400 million — it is not possible even if three such BFIs merge. To reach the Rs 400 million mark, they need to merge with more BFIs, but as soon as their number reaches four, they need to jump to Rs 1.2 billion. Even when 10 such BFIs merge, they cannot raise Rs 1.2 billion, so they would have to look for more partners. But as soon as the number hits 11, they have to become a national level development bank and their capital requirement jumps to Rs 2.5 billion. Although the bankers agree in principle that bigger capital would help banks become resilient to shocks, they say they would have liked to have more time to raise the capital through organic growth. Banks have now understood that the deadline is not going to be extended, and they need to work on a plan at the earliest. Most big banks in the country are in the mood to raise their capital on their own without entering into mergers. If they fall short even then, they are in a mood to acquire small BFIs to comply with the central bank’s policy. Smaller banks, whose paid-up capital hovers around Rs 2 billion, have limited options but to go for mergers. 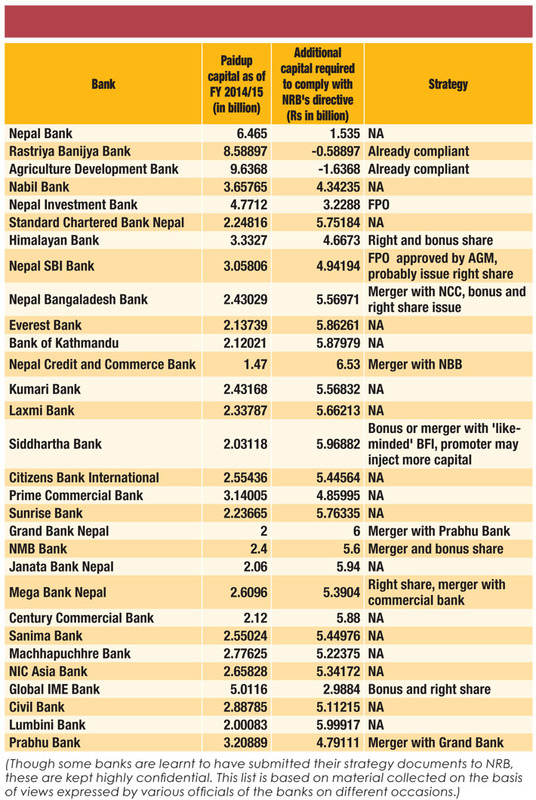 According to NRB officials, joint venture banks operating in Nepal had expressed some reservations over the new policy, but all of them are positive about bringing in fresh investment and comply. Bankers say that there are many challenges that need to be overcome for a successful merger, and it does not come cheap. A senior banker says the financial cost of a merger could run into tens of crores of rupees. The non-financial costs such as loss of skilled manpower may be even higher. When banks have too big capital base, their economy of scale will decline, and they will not be able to provide a return on investment as they are used to doing, says Upendra Poudyal, President of Nepal Banker’s Association. “Nowadays, banks are giving 20-30 percent returns; big banks will not be able to do that unless their business volume increases. This is unlikely looking at the economic condition of the country,” he says. He adds that if the central bank can pull this off, there will be nothing like it. But, if things go wrong, the decline in returns may push investors to put their money in unproductive sectors that do not contribute to growth. “They might put their money in real estate or the securities market and bubbles might be created,” says Poudel. But the central bank has an answer to that as well. Deputy Governor Kaphle says that when banks will become big, they will be able to invest in big infrastructure projects, and they will get more business as the banks will have a higher single obligor limit. Global IME CEO Gyawali too believes that servicing of returns would be a challenge as the market is almost saturated. “Going to new virgin rural areas has the constraint of lack of infrastructure as well as a small population to achieve an economic scale to justify the returns. Therefore, the most basic thing that is required from the state is to build infrastructure. When it does that, economic activities automatically increase, and banks get more business,” he explains. Development Bankers’ Association President Lamicchane thinks after the deadline to increase capital elapses, there will be around 17-18 commercial banks (now the number stands at 29), the number of development banks will go down to 30 (from the existing 79). “NRB will have one desk to look after each bank. Every day, the desk will monitor the bank. The big banks will become ‘too big to fail’. Nowadays, the failure of one bank does not have a bearing on the economy, but when a big bank fails, the government will have to bail it out using tax payers’ money. As a whole, it will take some time for the financial sector to come to terms with the new system,” he concludes. The central bank says it wants to move the country’s banking sector in the direction of a universal banking system with a limited number of banks. Under the new system, the existing classification of banks into ‘A’, ‘B’ ‘C’ and so on would be done away with, and the economy will have banks that have strong capital bases. These banks will finance big projects and may not be able to reach every nook and cranny of the country, so there will be microfinance companies to do that. A separate regulator will be formed to oversee the operations of microfinance companies, according to NRB officials. "This article was published on New Business Age (Sep, 2015)"